I have definitely experienced my fair share of Infinite Loops. I was a master at complaining about situations and why things weren’t working. I was even really good at being able to describe exactly where I wanted to be. But, I wasn’t really doing anything different that was going to break me out of the Infinite Loop and get me different results. In fact, for the most part, I was essentially doing the same things, but expecting somehow or someway things would eventually fall into place. “You can have results or excuses, but not both.” It was literally playing out in my life. Infinite Loops literally make you feel like you are on a “Human Hamster Wheel” – you are running and running, but not really getting ahead. Well, you know what I decided? I am so done with Infinite Loops in all areas of my life and of course I want you to join me. It’s time to break through each and every one of them and that means we have to be on the lookout for them because often times they aren’t easy to see. They can exist under our radar – especially if they don’t make us uncomfortable enough or if we have somehow convinced ourselves that is “just how life goes”. But, nothing could be farther from the truth. We are meant to break out of every single one of these Infinite Loops. Life is not about working really hard and trying to do what you are supposed to day after day just to end up disappointed and not have any results. Those aren’t the endings we are looking for and those also aren’t the endings we are meant to have. The key is to decide you are no longer going to tolerate being trapped in any Infinite Loops and get serious about changing things up so you can free yourself. 1. Recognize the areas of your life where you may be caught up in an Infinite Loop. 2. 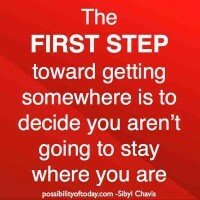 Decide you aren’t going to stay where you are. 3. Choose to do things differently. You’ve got to change things up and literally do things differently than you have been. It’s time to get creative and find the way out. Search for solutions. Work with new people. Find information that will help you – (send me an e-mail sibyl@possibilityoftoday.com and I will put you on the early list for the new course I am creating to break free from Infinite Loops). Ask yourself: What can I do differently today? And, then go and do it. Yes, it’s important to say that you want things to change but, the real question is what are you actually doing to make that happen? Today is the day to start. Please let me know your thoughts about this article in the comment section below. And, as always, if you need anything, please don’t hesitate to use the contact form or e-mail me at (sibyl@possibilityoftoday.com). I always love hearing from you.